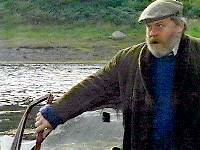 Loch Long appears in several episodes. From Plockton take the road to Durinish and go straight on to Balmacara, passing by Durinish and Balmacara Square. You will eventually reach the main A87 road where you should turn left and continue on for a couple of miles (passing the location used for the interior of the Stag Bar)and after a few more miles the turnoff to the A890 - the road which appears in "More than a Game" and the turnoff to Avernich which appears in "In search of a rose". After another mile or so there is a road on the left going to Conchra and Sallachy. 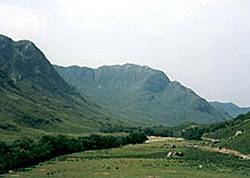 Take this road and travel along it for a mile or so until the loch is visible on the right. There is parking space on the right of the road opposite a farm gate. 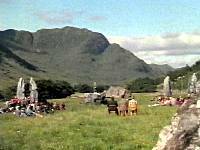 It is here that Lachlan is seen taking a dip in "A Pillar Of The Community". 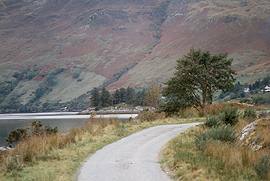 On the return journey from the bridge to Sallachy you will see a distinctive group of pine trees in the loch ahead of you when you reach a bend in the road. This is where the Lachlan-mobile is seen in "In Search of a Rose". Another location is on the other side of the loch. Retrace your steps until you rejoin the main road. Turn left, carry on for a couple of miles and take the turnoff on the left for Dornie (just after the bridge with the fine views of Eilan Donan Castle). 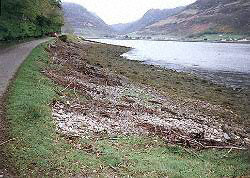 Continue on to Dornie and take the right turning (in front of the Dornie Hotel) to go back along the other side of Loch Long. 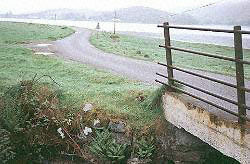 Go along this road for several miles until you pass over a small bridge with horizontal metal railings. Just past here (looking back towards where you have come from) is where the Lachlan-mobile is seen travelling to Zoot MacPherrins palatial pad in "West Coast Story".